This intriguing photograph was taken in September, 1941 with only a few short months before North America entered World War II. The people gathered within this photo are at a bar named Sloppy Joe’s, in the old section of Havana, Cuba. Jose Garcia owned the bar, a popular sandwich on the menu called, “ropa veija,” is what inspired the bar’s name. The woman sitting in the first row, situated between the two gentlemen, is my grandmother, Alicia Klukas Vasquez. My mother, uncle and grandmother were all traveling together on a large ocean liner from Brooklyn, New York to the country of Panama. The first port of call was Havana, Cuba, a sitter on board the ship watched over my mom and uncle, while many passengers, including my grandmother’s group explored Old Havana. Sloppy Joe’s featured a massive, 60 foot long bar and was the center of attraction. I vaguely remember seeing this photo at a young age, so it didn’t have a lot of significance for me back then. After being asked to scan the photo to provide copies for the family, I closely examined the image. What I now saw was an intriguing group of people who could have been actors out of 1940s Central Casting. The dynamic scene charged with atmosphere appeared as a production-style photograph, from a Golden Age of Hollywood movie. In doing research I learned Hollywood celebrities and world artist of the 1930s through the 50s would hang out at Sloppy Joe’s when in Cuba. 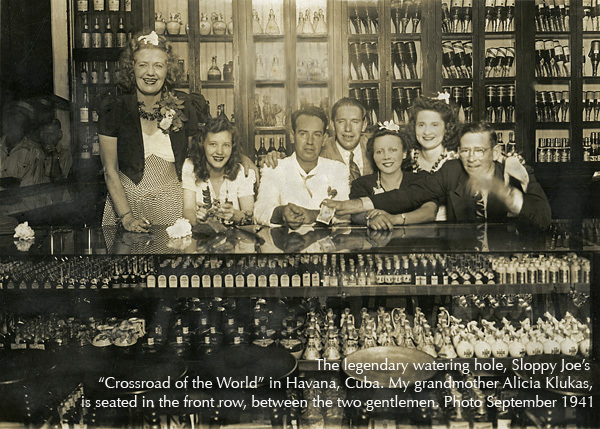 The bar was also known as the “Crossroad of The World.“ Writer Ernest Hemingway lived in Havana when this photo was taken, and was a good friend as well as a loyal patron of the bar’s owner. Sloppy Joe’s attracted iconic actors; John Wayne, Clark Gable, and Spencer Tracey when they arrived in Havana. Learning of the watering hole’s patronage, I enlarged and examined the background in detail, to see if a famous face was peering from the shadows. The bar remained popular and active until the early 1960s when Fidel Castro’s communist revolution closed the doors. The forward magazine of USS Arizona exploded after being hit by a Japanese bomb on December 7, 1941. Frame clipped from a color motion picture frame taken from on board USS Solace. After the ship departed Cuba my grandmother and her children arrived in Panama, where my grandfather was stationed in the Navy. Now united, the family was together for less than three months before the attack on Pearl Harbor. ( Link to my essay on photographing the New Pearl Harbor Visitor Center in Hawaii. ) → photos of Pearl Harbor Visitor Center | bigpictureone Fear of the Panama Canal being invaded by the Japanese army, required all American citizens to be evacuated. On an ocean liner once again, my mother and her family were halfway to New Orleans when a German U-boat submarine began stalking their ship in the Gulf of Mexico. The captain of the ocean liner, desperately, but wisely had all families bring their children above deck to line the railings for the U-boat’s German crew to see it was a civilian passenger ship they were about to attack. Fortunately, the wolf-pack sub slip quietly under the sea and was not seen for the rest of the voyage. Cinema note: If you’d like to see what Sloppy Joe’s looked like back in the day, check out the 1959 film “Our Man in Havana“, starring Alec Guiness. A Glimpse Into Havana’s Legendary Watering Hole. This intriguing photograph is from September 1941 with only a few short months before North America entered World War II. The people gathered in this photo are in the old section of Havana, Cuba; at a bar whose name was Sloppy Joe’s. Jose Garcia owned the bar, a popular sandwich on the menu called, “ropa veija,” is what inspired the bar’s name. The woman sitting in the first row, situated between the two gentlemen is my grandmother, Alicia Klukas Vasquez. My mother, uncle and grandmother were all traveling together on a large ocean liner from Brooklyn, New York to the country of Panama. The first port of call was Havana Cuba, a sitter on board the ship watched over my mom and uncle, while many passengers, including my grandmother’s group explored Old Havana. I vaguely remember seeing this photo, at a young age, so it didn’t have a lot of significance for me back then. This week after being asked to scan the photo for making prints was the first time I really looked at the image. Now, the intriguing group of people, in a scene charged with atmosphere as if from a Golden Age of Hollywood movie, captivated me. In doing research I learned this bar was where Hollywood celebrities and world artist of the 1930’s through the 50’s would go when in Cuba. Writer Ernest Hemingway lived in Havana when the photo was taken, and was a good friend as well as a loyal patron of the bar’s owner. Sloppy Joe’s attracted iconic actors; John Wayne, Clark Gable, and Spencer Tracey when they arrived in Havana. Learning of the watering hole’s patronage, I enlarged and examined the background in detail, to see if a famous face was peering from the shadows. The bar remained popular and active until the end of the 50’s when Fidel Castro’s communist revolution closed the doors in 1959. After the ship departed Cuba my grandmother and her children arrived in Panama where my grandfather was stationed in the Navy. Now united, the family was together for less than three months before the attack on Pearl Harbor. Fear of the Panama Canal being invaded by the Japanese army, required all American citizens to be evacuated. On an ocean liner once again, my mother and her family were halfway to New Orleans when a German U-boat submarine began stalking their ship in the Gulf of Mexico. The captain of the ocean liner desperately, but wisely had all families bring their children above deck to line the railings for the U-boat’s German crew to see it was a civilian passenger ship they were about to attack. Fortunately, the wolf-pack sub slip quietly under the sea and was not seen for the rest of the voyage. A fortunate update on Sloppy Joe’s in Havana has it being restored and should reopening in the near future. I hope the opportunity for me to travel to Cuba with my camera comes soon, as I would love to revisit Sloppy Joe’s and attempt to photograph the same camera angle used to capture that moment-in-time when my grandmother was there with her party.